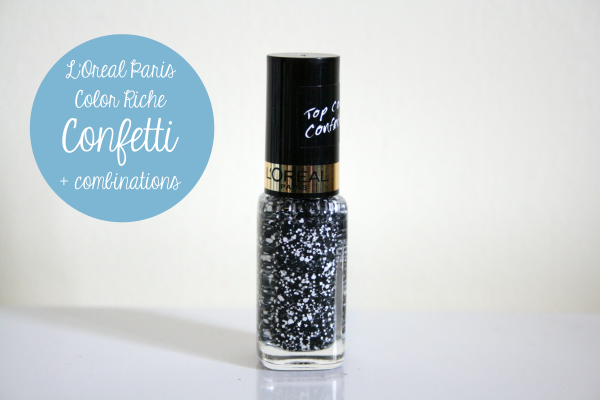 The confetti top coat has received a lot of blog hype over the past couple of months, and I completely understand why. It's gorgeous! The top coat is made up of little monochrome circles, which adds so much to a basic polish. The quality of the polish is excellent, and glides on smoothly separating the particles with little effort. I normally find with glitters that the particles stick together and it takes a while to spread them evenly, but this wasn't the case with this one! The top coat is quite expensive at £4.99 for a tiny 5ml bottle, but I can completely justify the price as the quality is amazing and the overall effect is really nice. Confetti is on offer at Superdrug for £3.99 at the moment, so be sure to check that out first before paying full price! 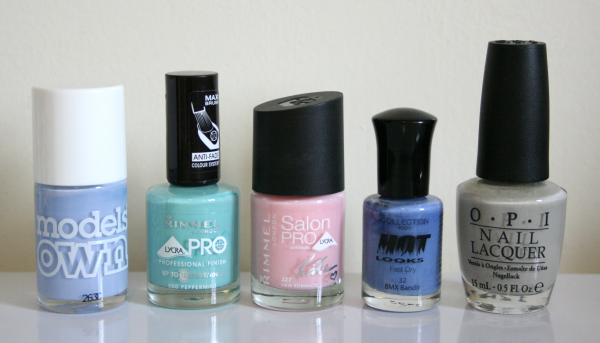 Models Own Beth's Blue, Rimmel Lycra Pro Peppermint, Rimmel Salon Pro Kate New Romantic, Collection Hot Looks BMX Bandit, OPI Skull and Glossbones. Which one is your favourite combination? Wow, I think I need to get this! It looks gorgeous over everything! Loving the effect the top coat gives, you are so right, looks amazing with the pastels! been wanting to try this for ages! thanks for sharing, pass by mine & perhaps we can follow each other?